Quest-Tech produces a vast range of metal products; however, our strengths lie mainly in custom sheet metal components and structural fabrication assemblies using various grades of carbon, stainless steel, aluminum, brass and copper. Unlike many of our competitors, Quest-Tech is able to provide and control all facets of sheet metal fabrication under one roof. Whether your product requires punching, laser cutting, welding or painting and silkscreening, Quest-Tech does it all. Having the ability to control all aspects of the manufacturing process allows us to offer superior quality, competitive pricing, and shortened lead times to our clients. 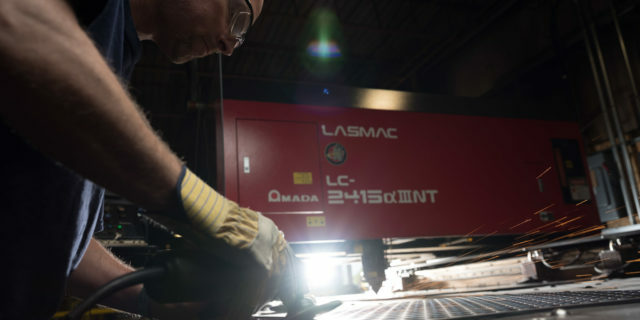 Enabled by our four state-of-the-art Amada Punch Presses, Amada Laser (4000W CO2), and plasma cutting abilities, we handle production runs cutting a wide range of materials varying in gauge and dimension. Our six modern Accurpress Brake Presses are CNC-controlled, capable of 20 to 400 tons, and extend up to 16 feet in length, allowing us to tackle all of your forming needs with ease. Our professional, certified welders can handle all of your welding requirements, no matter the alloy (SMAW/Stick, GMAW/MIG, GTAW/TIG). Additionally, we provide Spot Welding (up to 100 KVA) and Stud Welding (up to ⅜”) services to cover your other welding and hardware needs. We offer wet paint and powder coating services and are backed by some of the latest technology. Thanks to our Chemical Cleaning Line and Iron Phosphate preparation procedures, QuestTech is able to ensure the finished quality of your Carbon Steel & Aluminum painted parts. We have a variety of state of the art pneumatic and electric assembly tools on offer, including handheld and fixed Pem Setters, that enable us to perform your assembly tasks in a timely fashion. Our IPPC-certified wood shop can satisfy any of your custom crating requirements for all of your domestic and international shipments.